It’s the first Friday in August and you know what that means—it’s hot and it’s time for a giveaway! 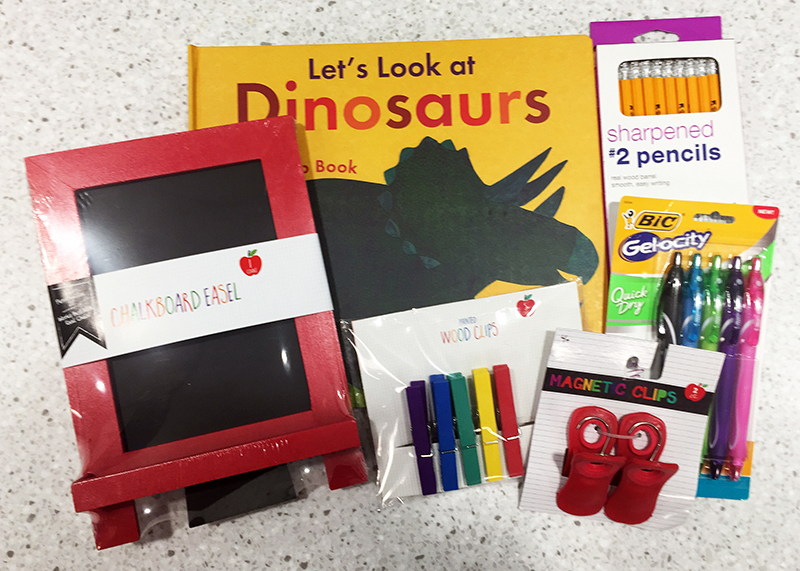 This month’s back-to-school prize pack includes a super fun “flip the flap” informational dinosaur book, a five-pack of colorful gel pens, a 24-pack of presharpened #2s, a pair of magnetic clips, a five-pack of colorful clothespins, and a nifty chalkboard easel that’s a perfect fit for a teacher’s desk. Pretty cool, huh? To enter for a chance to win the prize pack, simply choose a question from below to answer. Then leave your answer right here on the blog before midnight, Sunday, August 13, 2017. A. What is the first day of school for students? B. What have you purchased in preparation for school year. (supplies, shoes, etc.)? C. About how long does it take you to ready your classroom for a new school year? PS: We’ll announce the winner on the blog and we’ll also notify the winner at the email address used to submit the comment. In the event that the winner does not respond before October 1, an alternate winner will be selected. PPS: We have other contests running on our blogs too. Check out the community helpers books Karen is giving away. Click here. Congratulations to Kelly (comment 46). She is the winner of this month’s First Friday Giveaway! Our students start on August 17. A. The first day back for students is August 28th. Students first day of class is Monday, August 21. I have purchased lots of Target Dollar Spot items for my classroom, and some markers and glue sticks. I pick things up here and there and then it’s like Christmas when I take all the bags into my classroom and remember what I bought : ) I do have a sheet that I keep a total of how much I spend though so I don’t go over my budget or spend too much! My students first day is September 12. I teach preschool and they would just love the dinosaur book! Especially one little boy who is obsessed with dinosaurs! First day of school for students is August 23. I teach in Texas and the first day of school for most districts is August 28th. That is my first day. Yes, I have purchased supplies, and maybe some new clothes and shoes for the teacher. LOL! I live in South Dakota and I start putting my class together on August 1st each year. Our first day is the day after Labor Day and it will be a half day. first day was July 20. year round school. I have bought glue sticks, colored pencils, crayons, new homework folders. I cant pass up a good deal on school supplies. It takes me a few days to get my class setup for the new year. The first day of school for our students is August 22. The first day of school for students is August 17th. Our kids come back the 23rd. I haven’t purchased anything yet. Our students return to the classrooms on August 23rd. Takes about a week to get everything ready in my classroom. But I end up rearranging a lot throughout the year. First day of school for our students is Tuesday, September 5th. My kiddos start back on September 5, but us teachers go back on August 28. It takes me about a week to put my room back together but I spend all summer (about 8 weeks) putting stuff together and getting ready to get back in my room! First day of school is September 5. I haven’t purchased anything yet ???? The older kids start on August 24, but my kindergarteners don’t come into August 30. I have purchased stickers and sticker charts. It usually takes me 4 days to have my room set the way I want it. Our first day of school is August 21st. I have purchased a new Welcome sign to a new room ! It will probably take a week or more, had to move classrooms ! Last week of August is when we go back! And, I’ve gotten so much stuff for the new year, but mainly a lot of games; board, construction, etc. Our first day of school is August 21. It takes me a week to get my classroom ready and that is with two teachers working on it! The first day of school is August 16. We go back the Tuesday after Labor Day, 9/6. Students come back that Thursday, 9/8. Our kids start on Aug. 16. Have been working and cleaning on my classroom for 10 days. I have purchased many items for my room including some flexible seating. We begin on August 21 but due to renovations I cannot get into my classroom until next week! Ack! The first day of school for students is September 6th. The first day of school for students is August 22nd. Center Management Tags, Kindergarten Writing Paper, Markers etc. First day is September 6! August 16, 2017! Soon very soon! School starts September 5 this year. We have some new buildings being built so we are starting later! Our first day is August 23. I have bought some basic supplies, markers, pencils, etc. First day for our students is September 5th! It’s my favorite time of the year getting to know my students! It’s also the week of my birthday so I throw a small party in my class! It takes me about a week to get ready for the first day back to school! School starts next Thursday!! August 17th. I have purchased supplies in bulk: folders, penciks and notebooks. The first day of school for my district is August 22, my daughters birthday! Our first day back is September 5, 2017. School supplies from the target dollar spot… caddies and bulletin board decorations. First day for students is Aug 29th. School starts August 22. It’ll be my first day with Prek kids. I’ve worked wirh other children for the past 4 years. I have bought Excedrin migraine, 3 paid of comfortable shoes, and colorful sharpies so far! 3 pairs of shoes. Ha ha. The first day for teachers is August 14th and the kids on the 21st. It’s the annual shopping trip for new desk nametags and locker nametags, bulletin board decorations, writing tools, paper, and of course treats for back-to-school survival kits. The first day of school is the day after Labor day. Supplies purchased are washable markers (fat & thin), glue sticks, elmers glue, construction paper, copy paper, watercolors, tempera, dot paint, chalk, crayons (reg & toddler). First day of school is August 15th. School starts on September 5th this year. Our first day for kiddos is Tuesday, September 5. Day after Labour Day! In my district teachers go back August 22 and students return August 28.
our school starts 9/5. I am working on bulletin boards right now, and buying supplies for them. I am going from First Grade to PreK this year, so therefore I have purchased EVERYTHING!!! Furniture, books, manipulatives, curtains, books, containers, supplies, labels, decor–now shopping for my five teenagers to begin school!! I am very excited but worn out already ???? My own children start August 28. My preschool begins September 5. The first day of school for our students is August 28, 2017. I have been shopping the sales for supplies since the beginning of July. Just spent the last two days putting my room together! Our first day of school was Monday Aug. 7th. We get a full week (40 hours) of pre-planning time, which was put to good use! Our first day back is August 23rd. I have purchased new clothes supplies, and resources to use in my class. This year I prepped a lot in may before school let out but it took me 2 days this year. Thanks for the chance! Hope I win! Our First Day of school is August 16th. We start on September 7. My first day with kids was Monday:). I always purchase cute things from the Target Dollar Spot to decorate my room. I would love to have at least a week to prepare the classroom, but we only get about two half days to prepare. I found great primary journals this year that I was excited to get for my students! September 7th is the first day! It takes me about 4 weeks to get set for the year if I’m squeezing time in between driving kids around and being a mom (no complaints! – I love every moment with them). If it were uninterrupted time, probably 1 1/2 weeks. Teachers start August 14 and the students start August 21. First day is August 21st. I have purchased school supplies for the children and also teacher supplies that I need for the school year. We start in September. September 7 is day 1! A. We are a year round program with the month of August off so we start on September 5. We are a year round child care and I have two year olds. they will do anything for a sticker, so I always have a variety and pick them up as I see them! Our classes begin on Sept. 11. Our first day will be September 5.